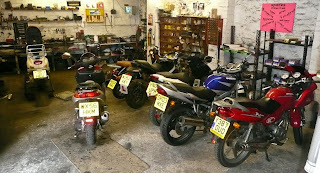 We do all sorts of servicing, but concentrate on the commuter bikes. We try and deliver a fast and efficient service, so your bike is back on the road as soon as possible. Accidents and repairs are also undertaken, and any breakdown or insurance work. Supplying comprehensive estimates for any work to be carried out. We fit tyres, for your commuter bikes. We also offer a recovery/collection service in our lunch hour, or on our way home, if you are unable to bring your machine to us. We endeavour to get you back on the road quickly, as we know your bike is important transport to you, and how you rely on your bike. We keep it safe until your collection or upon delivery to your door.